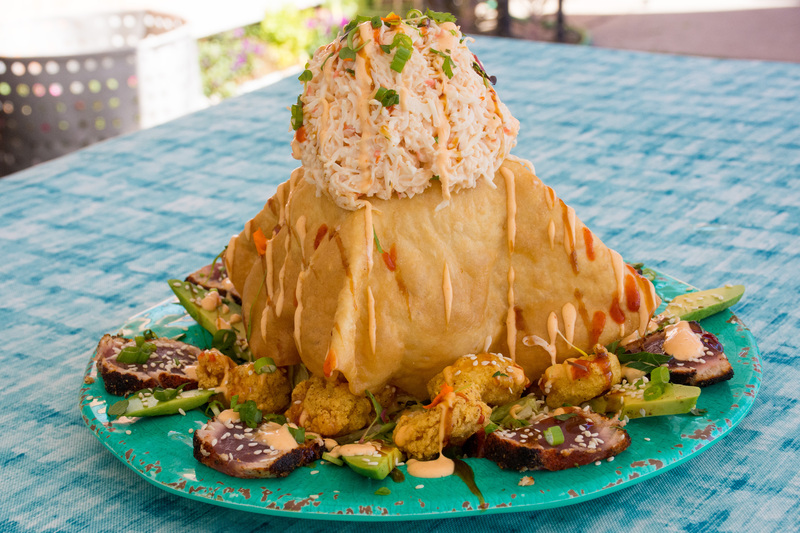 The “Seafood Volcano” at Seither’s: All that and a ziggurat of chips. In case you didn’t notice, a big TV food celebrity graced the Big Easy with his presence early last month to feature a few notable establishments on his program. That’s right: Guy Fieri returned to the 504, this time turning Mid-City and Harahan into Flavortown, USA. Triple D in the house, bro! When Guy chugged into the city in his lipstick red convertible Mustang, I was pleased he didn’t go straight for the French Quarter, but rather to Mid-City and, to the warmth of my heart, good ole Harahan. 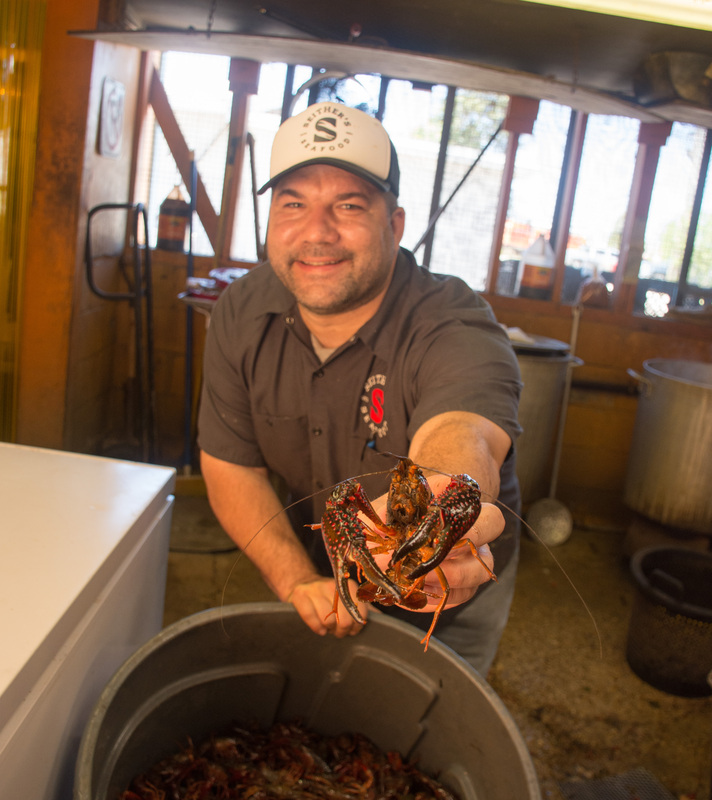 While the segments on Piece of Meat and Avery’s on Tulane were enjoyable, I was particularly taken with his Harahan sojourn to chat and eat with Chef Jason Seither of Seither’s Seafood. On a recent trip over to visit Chef Seither in Harahan, I did what many have done since the episode aired at the beginning of March: To feast on a giddy tower of delicious fried insanity. I was not disappointed. 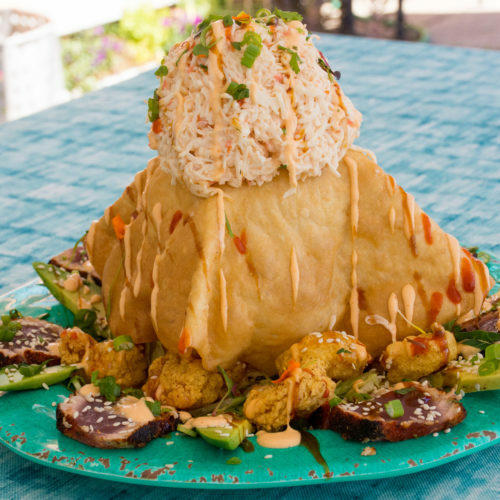 First came the “seafood volcano,” which was fairly close to its namesake. When the dish came to our table, it was precisely the same one the spiky haired television host gawked at, not a watered-down facsimile thereof. This was the real deal, a massive ziggurat of fried tortilla dough filled with fried shrimp and salad, adorned with slices of gently seared tuna, more fried, shrimp, and avocado, topped with a sno-ball-sized hunk of crab salad, and drizzled with “dragon sauce,” which is apparently what “donkey sauce” becomes when it enters the 504. “Basically,” explained Chef Seither, “it’s like an upside down Asian taco salad,” a description I found enormously helpful when I couldn’t figure out how to eat the thing. It seemed an object more worthy to be worshiped than consumed. Luckily, his prodding to “get in there, break it up and go to town,” didn’t fall on deaf ears. Once I hesitantly hacked into the volcano’s shell, it all literally fell into place, and I was able to get a bite with all the elements on a single chip of tortilla. I’m happy to report that, instead of just being another nightmarish food creation invented for sheer height, this dish not only works, it works well. When it comes down to it, the volcano is an intelligently composed dish. It just so happens that the composition is volcano-shaped. The madness didn’t stop there, though. 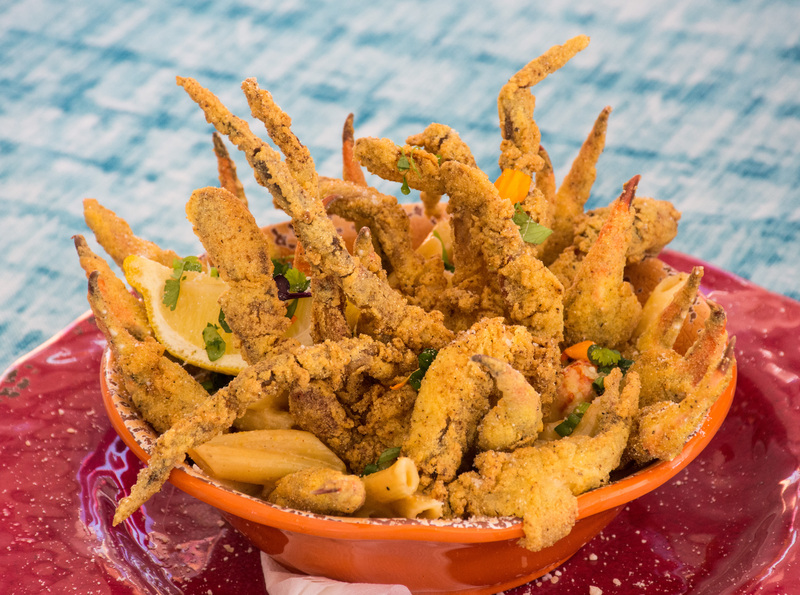 In addition to the volcano I was treated to another specialty: the “Crawfish Mac Daddy.” It being softshell crab season in New Orleans, no self-respecting seafood chef worth his boil mix would be content to offer up an over-the-top original dish without a lovingly deep fried softshell. In this case, the dish was a sinfully creamy bowl of crawfish macaroni and cheese festooned with fried crab claws and the aforementioned crustacean. Call of Cthulhu or seafood heaven? You decide…if you dare. The first word to enter my mind on seeing this plate before me was “Lovecraftian.” All those legs and claws and a whole crab jutting out of the bowl was reminiscent of nothing if not the deep fried call of Cthulhu, daring me into the insanity of R’yleh. Part of me was a little frightened the beast in the dish would reach out and drag me into the depths of a watery hell dimension if I came close, but it was worth the risk — that crab and the luscious mac and cheese beneath was too tempting. I dove in greedily and don’t regret the decision. Once again, what initially seemed like so many dishes featured on TV shows — all high style and little substance — turned out to be all substance, literally and figuratively. The crunch of the golden crab complements the creamy pasta perfectly, to the point that I wondered why all mac & cheese isn’t always topped generously with deep fried seafood. It was a combination I hadn’t imagined before, yet it works simply and beautifully. But if you’re headed to Seither’s for one of these dishes, or to maybe get a faint whiff of Mr. Fieri’s aftershave (my guess is that it smells like Mountain Dew Flamin’ Hot Funyuns) — you’re selling yourself short. In addition to the crazy stuff, Jason and his crew serve beautiful oysters, fish, po-boys, shrimp and crawfish, as any decent seafood joint in New Orleans should, and they do it right. The next time I head to Harahan, you can bet that I’ll be stopping by Seither’s for a dozen raw, a fried shrimp po-boy, and maybe, just maybe, some of that insane crawfish mac and cheese. Jason Seither, honorary gatekeeper of Harahan’s Flavortown.